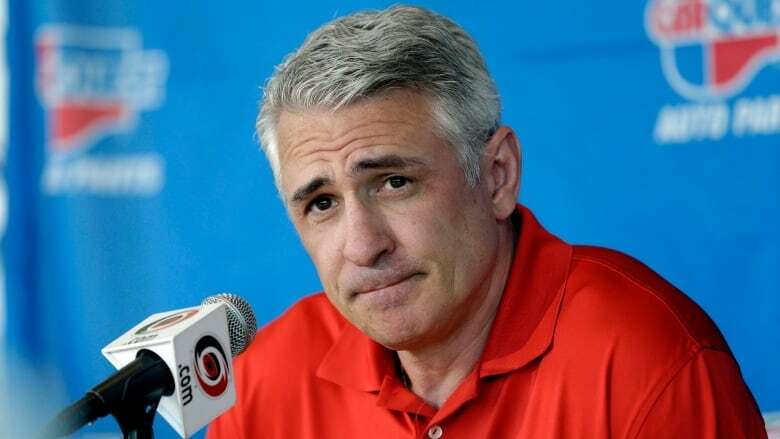 Hall of Fame player Ron Francis is out as general manager of the Carolina Hurricanes after four years, but will remain with the team in another front-office position. Hall of Fame player Ron Francis is out as general manager of the Carolina Hurricanes after four years but will remain with the team in another front-office position, new owner Tom Dundon said Wednesday night. Dundon says the team will begin a search for a new GM who will report directly to the new owner, while Francis will move into a new role as the team's president of hockey operations. "Since I took control of the team, I've had a good chance to be around and assess the operations," Dundon said. "There are a lot of good people working in the organization, but I feel that a change in direction is needed when it comes to hockey personnel decisions." The move came a day after the Hurricanes' 6-2 loss at Minnesota, which left Carolina four points outside the Eastern Conference playoff picture. In that game, former Carolina captain Eric Staal scored two goals against his former team while helping the Wild jump out to a 5-0 lead. Francis traded Staal two years ago to the New York Rangers in a deadline deal for a prospect and two draft picks. Dundon has been quick to shake things up in the two months since he purchased a majority interest in the team from longtime owner Peter Karmanos Jr. In his introductory news conference in January, he explained that the advice he received was that "you've got to trust" the hockey-minded employees because "I don't think I'm going to walk in and understand more hockey than [general manager Ron Francis]. That would be ridiculous."